We have been to Singapore many times in the past few years. Hotels are very expensive, so we prefer to stay with family and friends. A good 4-star hotel in Singapore will cost you around S$140-245 per night and a 3 star will cost you from S$120-175 depending on the location. I find it expensive because in Malaysia, 5-star costs around S$140 and if you get a good deal, you can also get a 5 star in S$105 unless you are a backpacker. You can check websites like Agoda to find good deals if you have to stay in a hotel or find accommodation through Airbnb. 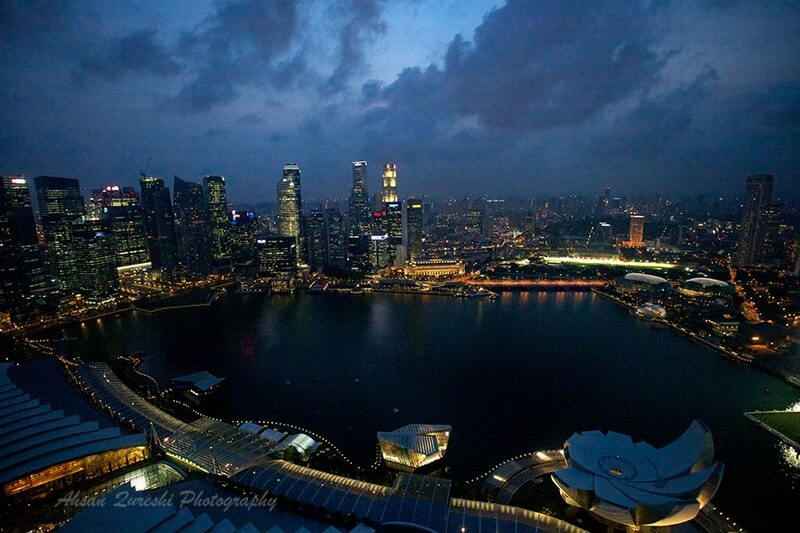 Even though it is expensive, Singapore is still a must see country. It is small vertical, island city state consisting of 63 smaller islands. Concrete Jungle as they call it, it is a land with tall buildings, home to 100% urbanized population and yet manages to be the greenest city in Asia. It has a highly developed economy and is a leader in many economic sectors. With its best-planned infrastructure, top notch public transport system, a superb road system and diversity of cultures, religions and languages, Singapore has a lot to offer to anyone who comes to visit. You can visit all famous places within the city by using the public transport as keeping cars and renting a taxi is quite expensive. Even if you drive from Malaysia, the vehicle entry permit fees, tolls and parking charges etc are quite high. There is a lot to do in Singapore. Apart from the usual things like, Hop on & Hop off city tour, Duck & Hippo Tours, China Town and Little India, there are some experiences that you can only get in Singapore and must be planned properly. It is Singapore's 4th largest Island and can be reached by using MRT or the Sentosa Express. You can also drive yourself or use the public buses. Here are all the best ways to reach Sentosa Island. It is small Island but, still, one day is not enough for Sentosa if you want to see everything. Plan your activities carefully and divide them in 2 -3 trips so that you can do them all. Sentosa has 3 main beaches, Palawan, Siloso and Tanjong. 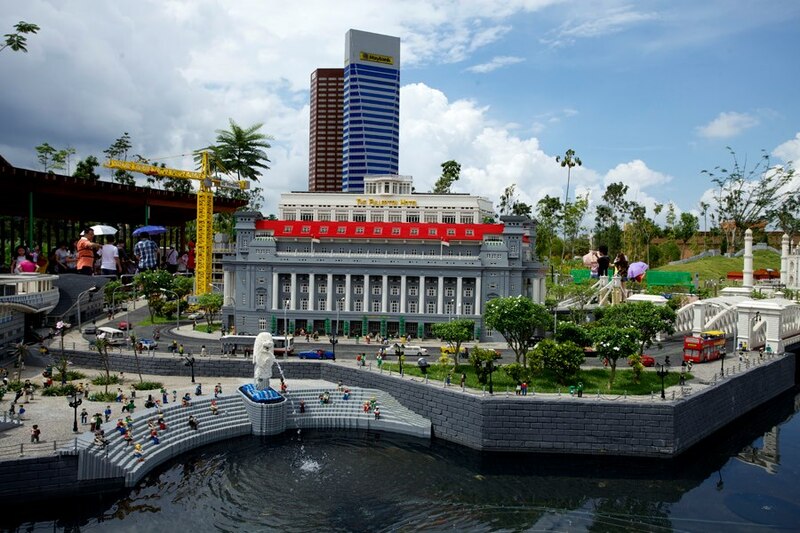 And there are a lot of other touristy things to do like the SEA Aquarium, dancing water fountains called the Song of Sea, Madam Tussaud's, Sentosa Merlion (The Merlion is Singapore's Icon - a mythical creature with a lion's head and a body of a fish) butterfly and insect park etc. I suggest the cable car ride to reach Sentosa so that you can see the bird's eye view of Singapore skyline. 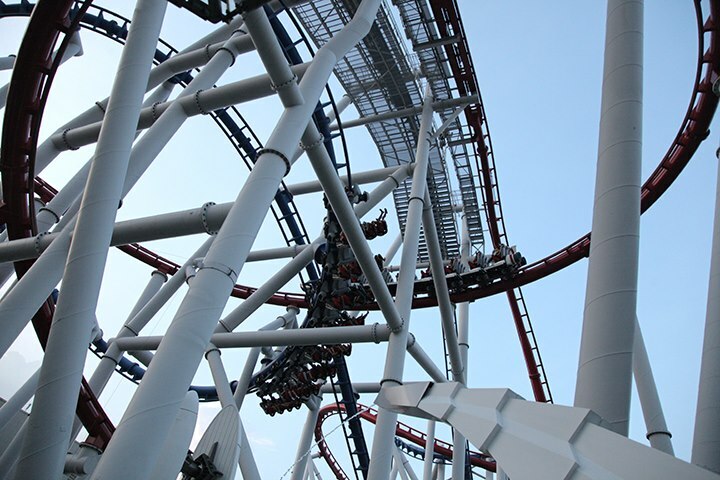 It also has the famous Universal Studios opened in 2010. When we visited the Universal studio, we spent a full day there as my nephew and niece wanted to experience every possible ride and section. We took the MRT to reach Universal. The entry ticket for adults is S$74. If you go on a weekend you will have to spend a lot of waiting time for rides. It is better to buy an express ticket so that you can enjoy your day (additional S$30 on the entry ticket). 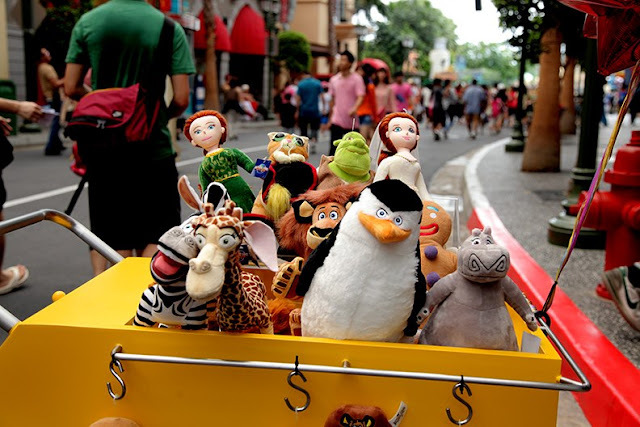 Mascots of famous characters keep appearing on and off, and if you are lucky you can get a chance to have a photograph with them. Kids and adults get equally excited to see Alex from Madagascar or Prince Charming from Shrek. 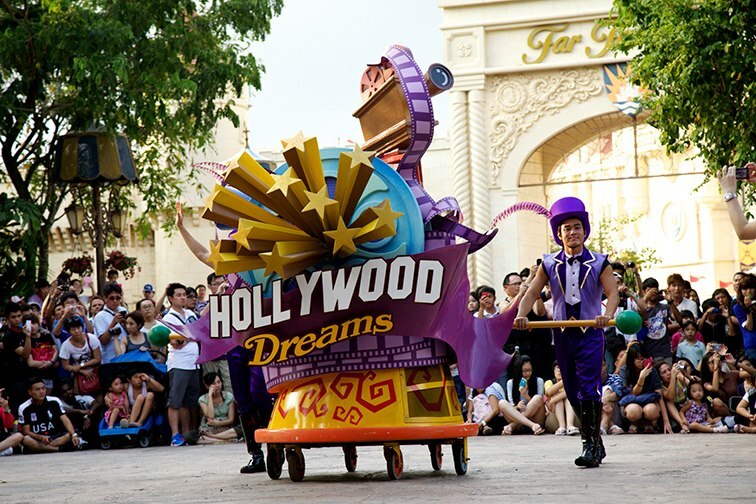 Don't miss the Hollywood parade where you get to see all your favourite characters from Universal Studios.There are plenty of food options and even a Halal Arabic restaurant. Here is their official website with all relevant information. Have you seen that famous ship shaped hotel on top of three buildings? I think in recent years, it has become the landmark of Singapore. Only 9 KM away from the Universal Studios, it is an EXPENSIVE 5 Star hotel with rooms starting from S$520 (normal 4-star hotel costs S$140). The three towers have 55 stories each and are connected by a one-hectare roof terrace. The roof terrace has world's longest elevated infinity swimming pool. On the roof terrace, there are restaurants, clubs, garden and public observatory deck that offers a 360-degree view of the Singapore skyline. 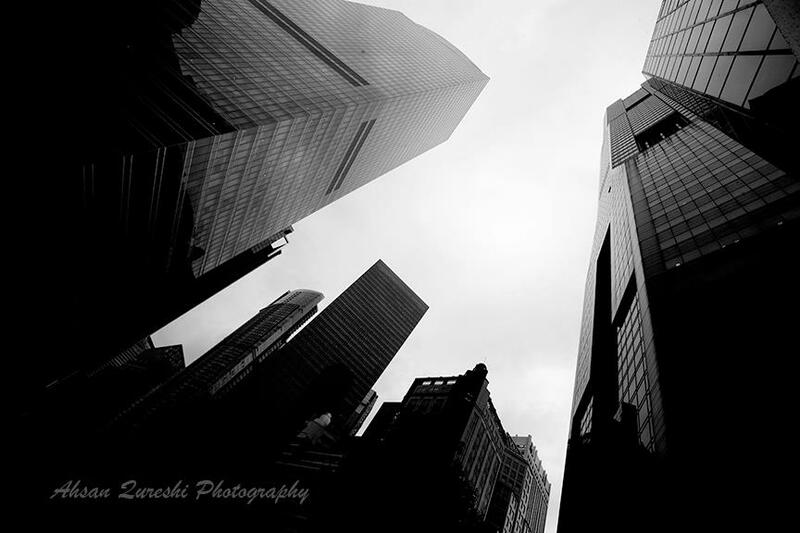 You can go by taxi, public bus or water taxis to see this amazing architecture even if you are not staying in the hotel. You can go up to the observation deck and order at the restaurants. There is a certain number of people that are allowed on the deck at one point, so sometimes you have to wait. The pool is only limited to the guests, though. But with an entrance fee of S$23, you can enjoy the breath taking views especially at night when there is also a light show called Wonder Full which is open to the public. See the timings here. Next to Marina Bay Sands is the Gardens by the Bay which is a city in a garden. 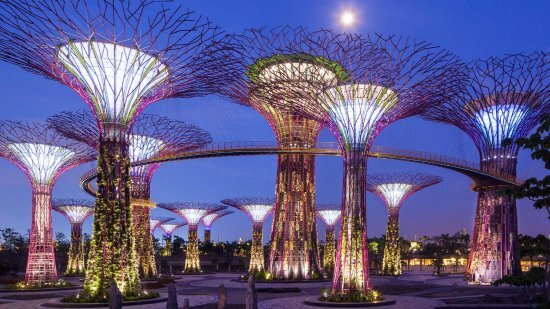 Entrance to Gardens by the Bay is S$5-S$28 for adults and then you need to pay to visit different smaller gardens. Spread on 101 hectares, it has three sections – Bay South, Bay East and Bay Central. The most famous things to see are conservatory Flower Dome and Cloud Forest for which you need to pay an additional fee and Super Tree Groove where the entrance is free. This is on my list to do when I go next. A 2.2KM long boulevard with shops, malls, cafes and restaurants; ideal for shopaholics and foodaholics. Istana, the official residence and office of the president is also on this road. Istana ground is open to the public during festive seasons like Chinese New Year, Eid or Deevali. All famous malls like the Plaza Singapura which has IMAX Theatre; Orchard Central, Singapore's first and tallest vertical shopping centre; The Paragon etc are all on this one road. You can reach Orchard using the MRT easily. A little away from the Orchard Road, at walking distance of around 15-20 minutes, you have non-shopping activities like Museums, Church, the Singapore Botanic Gardens etc. Make a list of places you want to visit and you can manage pretty independently. Singapore is very humid and hot, so keep water with you if you plan to walk around. You must visit the Singapore Zoo as it is one of the best zoos in the world. All the animals are in open, naturalistic habitats separated from visitors by dry and wet hidden moats. Admission fee is around S$33 for adults. You can see all the details on their website here. Keep a good supply of water and wear something light because you will have to walk a lot and sweat like crazy. While I write this, my hubby insists that I mention the Night Safari which is the world's first nocturnal zoo. There are around 2,500 different species also in natural like habitat. Zoo operates only in the night. It has seven zones which you can see on foot or trams. You see the animals in the artificial moonlight. For me, it was not really exciting to walk through a dense jungle, hear sounds and movements of animals but not really see them. In all the photographs of that night, I am forcing a smile while my eyes are wide with fear. 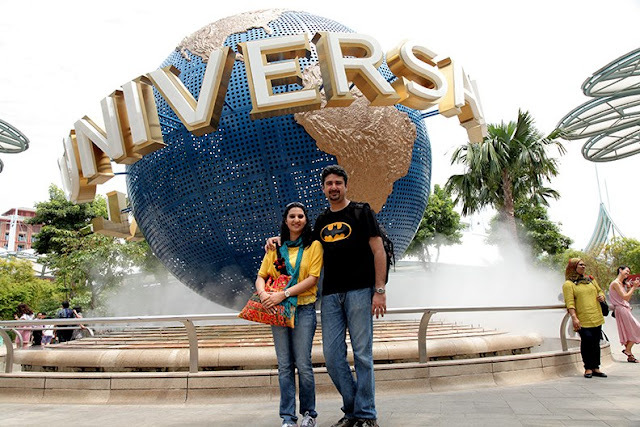 But, it is an experience for animal lovers and one of the most popular and unique tourist attraction of Singapore! So, you must go for once in a life time experience. Here you can find all the information you need. My favourite street to be. Halal food in one row! Yay! It got its name because it was near an Arab village. It is a hub for Muslim traders. Here you will find the shops of Persian carpets, textiles, Sarongs, baskets and leather bags. You will find old styled curry houses and Middle Eastern restaurants decorated with typical Arabic embellishments celebrating its colourful heritage. Malay, Indonesian and Singaporean food is also available. There is this famous Pakistani restaurant there that every single Pakistani in Singapore must have been to, called Usman's Place. We have dinner there every single time we visit the country. 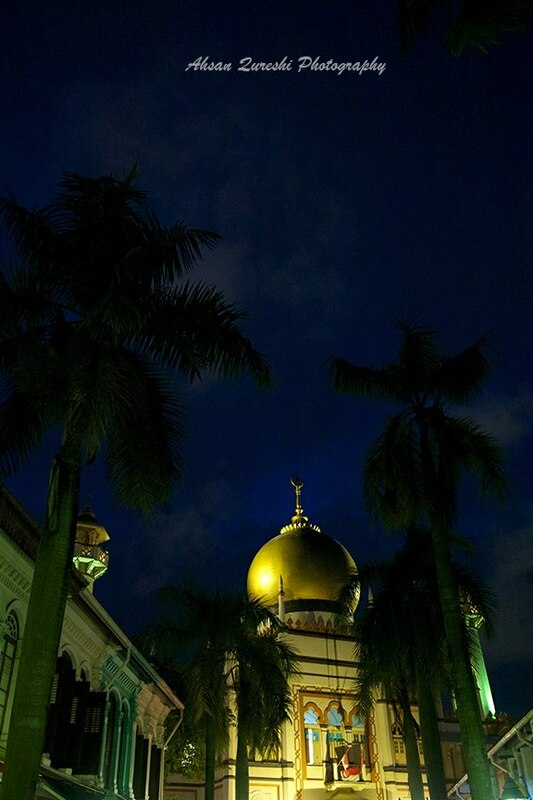 And in the heart of Arab street stands the beautiful Sultan Mosque, which is the national mosque of Singapore. During our first trip in 2007, we visited Pulau Ubin which is a small Island in North East of Singapore. It is one of the last islands which don't have much urban development and concrete buildings. We had rented bicycles and toured the whole Island. The boat ride from main land Singapore is only 10 minutes but its natural beauty is quite a contrast to the concrete jungle. Read my detailed post about Malaysia here. I feel so nostalgic now. Need to go again, soon! Both of you, pack your bags and lets gooooo! Very informative thanks. It is a good idea to apply visa for Malaysia too! This looks like you had such a nice time! I'm happy you both were able to fulfill your nostalgia! I've always wanted to visit Singapore. Hubby has gone and raves about it. Definitely a travel destination on my bucket list. Wish I would have come upon your blog post before I visited Singapore! I feel like I didn't explore the country enough. 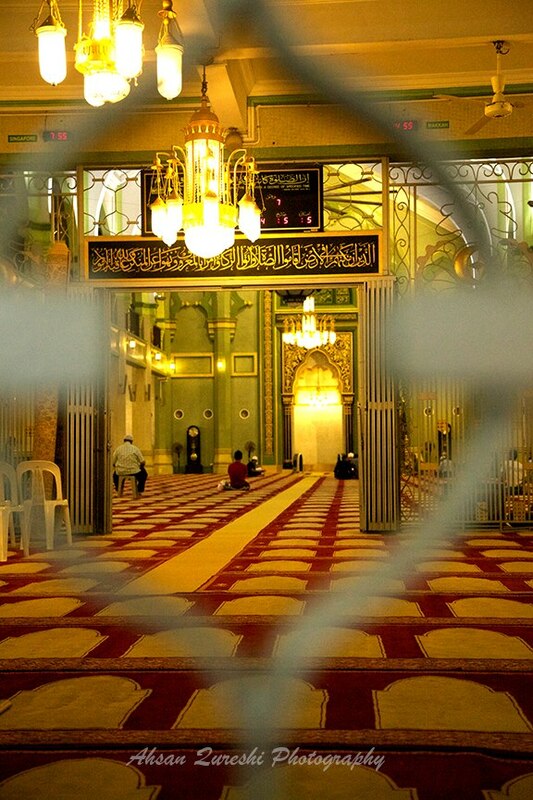 Your suggestions are awesome and I would have loved to visit sites like the Arab Street. Oh well, next time! I would love to travel abroad again; went to London when I was 13. You have convinced me that I should not go back to London and hit Singapore!